Here’s another important factor to consider in treatment, the family. Treatment centers also understand that addiction is a family disease and each member of the family has a role to play in the recovery of an addict. Is there a family therapy program? The program must include sensitivity to gender issues, sexual orientation, race and ethnicity. The pathway to becoming clean and sober is not just limited to the physiological issues, it must include the entire scope of human experience. Counselors and therapists will employ a variety of theories and techniques to help the individual through the rehab process. This is another important area to consider when choosing the right rehabilitation program. Here are a few examples of approaches that behavioral health professionals will use in helping patients. This is the disease model of addiction. This theory suggests that addiction is purely a physiological problem. For example, one of the aspects is temperament and this model would suggest that human temperament is a physiological phenomenon, nothing more, and some temperaments are more predisposed to addiction than others. The points they examine for diagnosis are heredity, anatomy, physiology and biochemistry. They exclude the impact of personal history or any spiritual component. Most people have heard of Sigmund Freud, who was the father of psychoanalysis. You are familiar with the scene of a patient lying on a couch talking about their childhood. This theory would argue that drug addiction is caused by unresolved conflicts and repressed anxieties. The therapist would use free association, memories, dreams and tests like the ink blots to make a diagnosis. The therapist will probe the unconscious and try to identify defense mechanisms. They assume some childhood anxiety is at the root of your defensiveness, and somehow using drugs is a coping tool. The therapist using this model is looking for incongruence. Say for example, that you are asked how you feel. You render a deep sigh and replay with a droopy face, “Oh, I’m OK.” That’s incongruence. They would view drug addiction as being a problem, because it limits or denies self-actualization. It is all based on the patient’s reporting of their attitudes and feelings. The operative word is learned. Drug addiction would be considered a maladaptive behavior, caused by deficiency in learning—that is, you’re not learning the right things. Drugs are a conditioned response. You take drugs, you feel good and you want more. Therefore, you have to unlearn that maladaptive response. This perspective integrates all of aforementioned approaches. Borrowing from all four, a spiritual component is added. This is “soul care” and is an integrated, holistic approach to the problem. A prime example is the 12 Step process, although it is not, by definition, a faith-based method, as practiced by Alcoholics Anonymous. It encompasses all of the theories, but also addresses the helplessness of addiction by introducing the idea of a “Higher Power” and “God, as we understood him” to help the individual deal with the changes. Many religious groups have embraced this approach, adding their own belief system to the process. Treatment is designed to restore the individual to his/her family and life. Treatment, however, is really just the beginning. A person is well advised to become a part of the recovery community to maintain healthy choices and have access to emotional support when dealing with difficult moments. 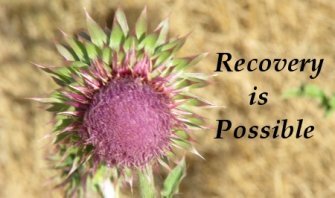 What does it mean when a person says, “I’m in recovery?” They have gone through treatment and they’re back on their own, trying to stay clean and sober. They are not using. If a person is using, they are not in recovery.